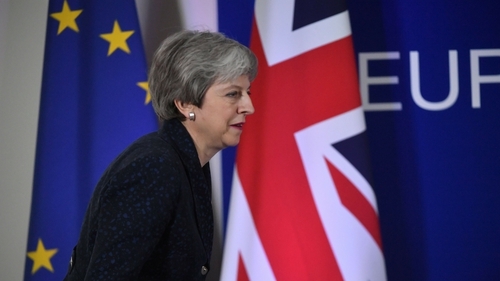 British Prime Minister Theresa May has admitted she may not garner enough support to get her twice-defeated Brexit deal through the Commons next week, amid mounting speculation about the future of her leadership. Mrs May wrote to MPs warning that if there is insufficient support for her Withdrawal Agreement in the coming days, that she could seek an extension to Britain's EU membership beyond the European Parliament elections. It came after the DUP - whose support will be crucial if her government is to win - indicated they would not back her deal, with the party's deputy leader Nigel Dodds lamenting her failure to secure any changes to the backstop while in Brussels. She said the UK could revoke Article 50; leave without a deal; ask for an extension beyond 12 April if her deal is rejected or not voted on; or leave on 22 May if it is finally approved. A cross-party group of pro-EU MPs claimed they had the numbers to force a series of "indicative votes" on alternatives to Mrs May's Brexit deal. But Business Secretary Greg Clark said the government was prepared to enable Parliament to express a view on the various options if Mrs May's deal is rejected by the Commons for a third time next week. It comes as hundreds of thousands of supporters of a second referendum will march through central London today, where Labour's deputy leader Tom Watson is expected to say he will vote for the PM's deal if it is put to the people.